When Is A Knight Not “Really” A Knight? Once Again, You Can Find Heraldry Everywhere! I had run across one of the articles linked to below, and then also had a regular reader send me another link to it. So I knew it had to be something that you all needed to know about. 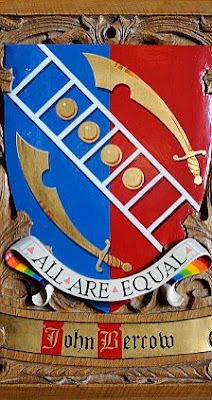 It seems that John Bercow, Speaker of the House of Commons in England has recently had an official portrait made, and – and this is where it relates to this blog – the frame incorporates his new coat of arms. Now, that is not in and of itself all that newsworthy. I mean, there are portraits of Speakers going all the way back to Sir Thomas More. What makes it newsworthy in the eyes of the media is that the costs of the portrait and frame, which come out of the House budget, ran to some £37,000 (US$57,765). And this at a time when HM Government is trying to pass austerity measures in response to the struggles of the British (well, and everybody else’s, too) economy. 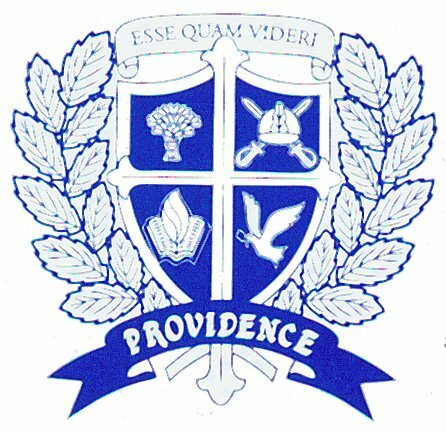 Anyway, there was a story dated November 2, 2011, in the Greenwich, Connecticut Greenwich Time about Peter von Braun, who is running for election to the Board of Education there. There is, apparently, some controversy being stirred up by his opponents about the fact that he calls himself a knight. What the controversy really boils down to is that Mr. von Braun has not been knighted per se, but is a Knight of Grace of the Order of St. John, a chivalric order headed by Queen Elizabeth II. So he can’t add “Sir” as a title to his name, but, yes, technically he is a knight. 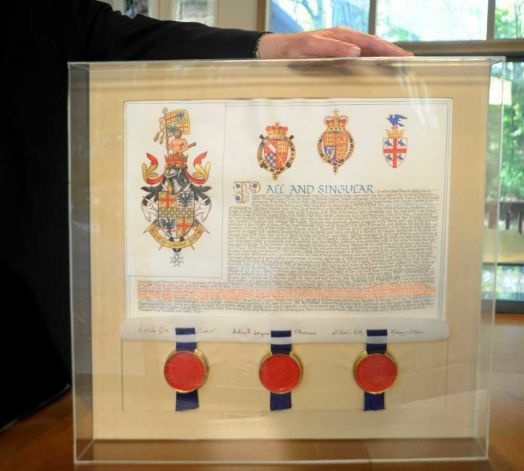 The part of the story that interested me was the pictures, showing von Braun with the grant of honorary arms he received from the College of Arms in 1983, along with a close up of the grant alone. Even when the arms are pretty complex (and these seem to be pretty complex, quarterly with a checky fess), it’s always of interest to see someone’s grant of arms. ... and it continues to be regularly proven to me: You can find heraldry everywhere. And sometimes, you don’t even have to go out looking for it. Sometimes, it comes right to you. In this case, it was on a sticker that had been placed on the front page of the Sunday edition of the local newspaper. Providence Christian School of Texas was advertising their having an open house, and prominently displayed on that sticker was their arms-like logo. 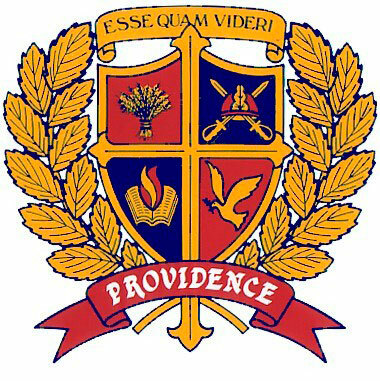 Alas, they have fallen into the same trap that has snared so many (including, I am ashamed to report, the Times of London), that of calling their coat of arms a “crest.” Still, if you can get past that, a page on their website (http://pcstx.org/prov.cfm?M=about_us/providence_crest) explains the elements of their coat of arms and motto. It’s not terribly good as heraldry (the cross, for example, extends beyond the edges of the shield, and they’ve succumbed to the desire to make the shield quarterly with a completely different charge - or charges - in each quarter), but still, it’s an attempt, and better than some I’ve seen before. But, to repeat: You can find heraldry everywhere! Even delivered to your front door. I’ve said it many, many times, and it continues to be proven true: You can find heraldry everywhere! 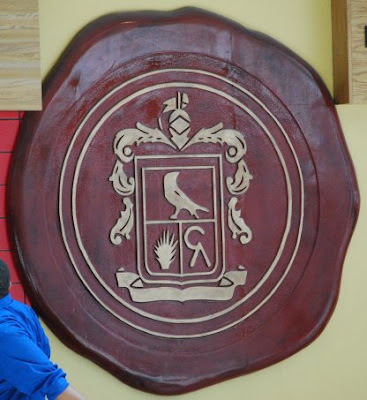 In this particular case, my wife and I had gone out for a lunch of her favorite food (that is, “food that’s been fixed by somebody else”), and right there in the parking lot was a van with the following coat of arms prominently placed about it in several places. 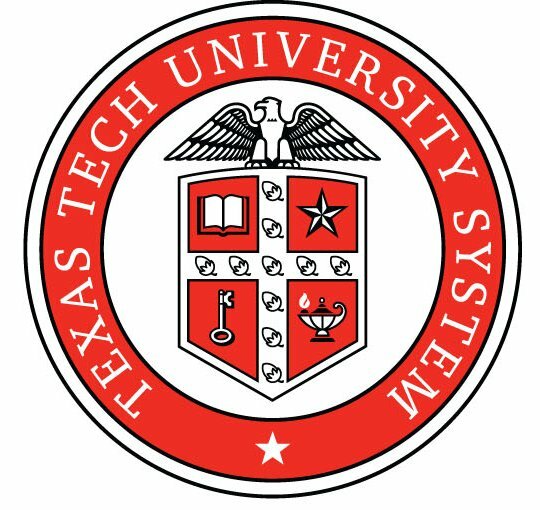 These are the arms, or at least the logo, of the Texas Tech University Student Housing. I'd blazon them as Quarterly gules and argent, in bend an open book and a lamp of knowledge argent, and in bend sinister a mullet gyronny of ten sable and argent and a key erect wards to chief and to sinister sable. (Sable, in spite of the fact that the key is at least 50% white. But that's "metal on metal", and we all know that that would be very bad contrast and "just isn't done, don't you know.") The shield is surmounted by an eagle displayed argent. 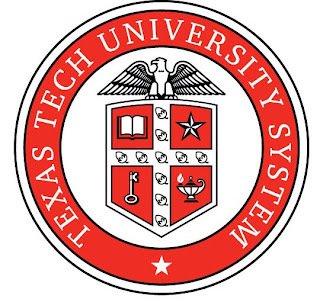 The arms appear to be a variant of those that appear on the website of Texas Tech, which use an entirely red shield with a white cross throughout charged with ten* acorns bendwise (acorns are "reversed" or inverted, what many of us would think is upside down, by default), and the same charges (open book, star, key, and lamp) in the four quarters. Now, Texas Tech is located in Lubbock, Texas, nearly 350 miles from the restaurant where we were eating. I have no idea what it was doing in little ol’ Cedar Hill (the next town over from where we live in Duncanville) at the time. But still, it’s just further proof that you don’t even have to be looking for it to run into heraldry. Just keep your eyes open and you’ll see it, even in a society that often seems to disparage the use of coats of arms as elitist or snobbish. * I've heard the opinion that heralds cannot count that high; that for many heralds, the numbering system goes: one, two, three, four, five, six, semy (or many). This is not strictly true; I've seen blazons that specifically numbered up to sixteen. But, still, it's not a bad rule of thumb. The United States Postal Service issued a set of four Navy heroes stamps last year. Each one has a bust of the person so honored, and includes a bit of heraldry for each one. All of the images of the stamps that I’ve found are not that large, and the exact designs of the heraldry/insignia (which a placed down in one corner of each stamp) aren’t at all easy to make out, but they appear to be the coat of arms or insignia of a ship on which the particular individual served. Arleigh A. Burke, a top destroyer squadron commander in World War II, who later served three terms as chief of naval operations, the Navy's highest ranking officer. John McCloy, one of the few men in the history of the U.S. to earn two Medals of Honor - one for a rescue mission during the Boxer Rebellion in which he was wounded and the second during the 1914 Mexican Revolt for intentionally exposing his boat to draw enemy fire to identify their positions. In 1919, he was awarded the Navy Cross as commander of USS Curlew, which engaged in minesweeping in the North Sea after World War I. 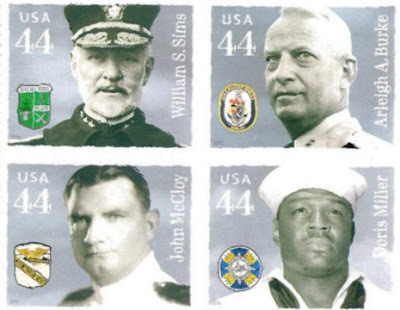 Petty Officer Doris Miller (I've always heard his name pronounced as if the "s" were silent: Doree), cited as the first black American hero of World War II. At Pearl Harbor on December 7, 1941, he was a mess attendant on the battleship USS West Virginia. Miller helped rescue scores of shipmates wounded or trapped in wreckage, later helping move the ship's mortally wounded captain. Never trained in its operation, he manned an unattended 50-caliber machine gun to fire on Japanese aircraft until ordered to abandon the bridge as fires raged out of control. He was awarded the Navy Cross and was killed in action in 1943. William S. Sims, commander of U.S. naval forces in Europe during World War I, who was an outspoken reformer and innovator who helped shape the Navy into a modern fighting force. 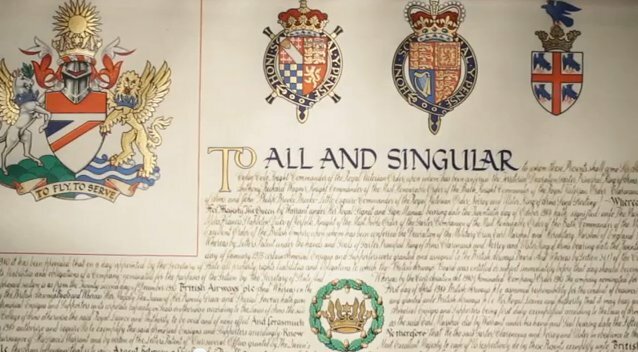 It’s nice to see such a public use of heraldry, even if it did happen early last year and I missed it then. 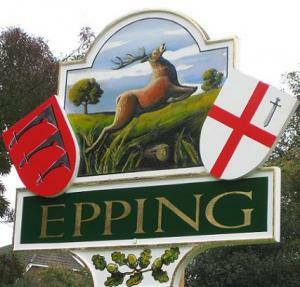 Someone noticed that the other shield on the sign, with the arms of the City of London, had the sword upside down and on the wrong side of the shield. (And I would note that it is the wrong color, too! It should be the same red as the cross.) The sword should properly be placed in the dexter chief quarter of the shield (the upper left as you look at it), and on the sign it is placed in the sinister chief quarter (the upper right). 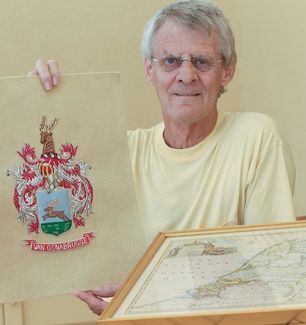 Willem van Osnabrugge, who grew up in The Netherlands, was interviewed by Paradise Afshar of the Bradenton Herald about this commission. He has been creating embroidered coats of arms for his friends for some years. Eventually, he created a website to showcase his work, and Jacobine Wieringa of the Carnegie Foundation saw it and contacted him. The Carnegie Foundation is building a visitor center in front of The Peace Palace and they wanted embroidered coats of arms for two nations that have passed into history: Austria-Hungary and Yugoslavia. and the more recent rendition done by a graphics design company, which keeps all of the elements of the original while at the same time modernizing them and allowing for three-dimensional renderings, as well. Frankly, I think it’s great when companies update their coats of arms rather than simply (and usually more expensively) sending off to a graphics design firm for a new logo (most of which will be outdated in a few years). 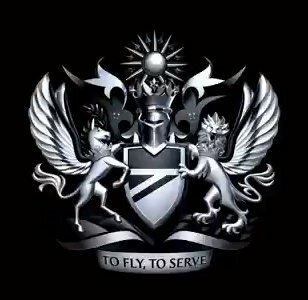 And, as one of the company spokespersons noted in the video, the British Airways achievement of arms is “as relevant today and tomorrow as it always has been.” And isn’t that a goodly (in both senses, large and beneficial) part of the attraction of the use of heraldry anyway? Returning back to Dallas, while sitting down for a quick bit of lunch between planes at the airport in Charlotte, North Carolina, I found one last bit of heraldry on this trip. It was on the front of a Mexican restaurant called Tequileria. (Looking them up on-line, I find that, naturally enough given their name, they emphasize their “top shelf tequilas” and “impressive array of margaritas.”) I didn’t go in (I was eating at another establishment a short way away), but I did see this on the front wall of the store.